I’m going to tell you something about myself, even though I’m not proud of it. I…Kitch…of part-German heritage, do not enjoy German food. And when I say, “don’t enjoy,” I’m being pretty kind, since there’s a lot of German food out there that I find flat-out revolting. It’s shameful. But. I’m the girl who loves everything potato, remember? If there was ever a contest out there crowning “Miss Tuber U.S.A.,” I’d sign up and give the other contestants a serious run for their money. So how on Earth could I eschew German food–perhaps the most potato-centric cuisine on the planet? You Irish people (okay, I’m part Irish too but shut up) and you Eastern Bloc people like to brag about your allegiance to the mighty potato, but I think Germany wins the statue. Germans love potatoes so much that they even scarf them down (copiously) when they’re merely peeled and boiled to death, sporting maybe a pathetic little sprinkling of parsley. Those are the saddest damn potatoes in the word and the Germans hoover them down faster than you can say “schnitzel.” Those are serious potato people. The problem I have with German food, I believe, is my aversion to the whole sweet/sour thing. When it comes to food, I loathe all things on the sweet/sour flavor spectrum. I made an exception during pregnancy for sour gummy crack candies, but that was a hormonal oddity never to strike again. My distaste for sweet/sour spans across cuisines; I’m not a sweet-and-sour racist. I won’t touch sweet and sour pork at the Chinese restaurant and I’m not touching the mango chutney that comes with my Indian takeout. In my opinion, things should be sweet or they should be sour, but never the twain shall meet. I’ll eat a sweet French gherkin with my cheese plate and I’ll eat a puckery dill pickle with my pastrami on rye, but if you hand me a bread-and-butter pickle for any reason, I will growl at you. Sweet and sour is gross. And Germans love it. My Daddy-o loves it. He’s a good German boy, after all. This caused me great pain as a child, because sometimes we’d be in a restaurant that served vomit-inducing things like German braised red cabbage or, God forbid, Sauerbraten, and my father would spy those items on the menu and his face would light up with joy. Then I’d have to smell that sugary, vinegary, nostril-assaulting monstrosity throughout my entire meal. It’s enough to turn a girl off her plate of macaroni and cheese, I tell ya. By some stroke of luck, Mama rarely indulged Daddy’s love for German food at our own dinner table. Once in a while she’d serve a breaded pork cutlet or hand him some sausages to throw on the grill, but that was mostly it. There was the incident with dreaded Sauerkraut Salad from the White Trash Motherlode cookbook, but I protested so violently and so obnoxiously about that that she agreed it was best if Daddy got his German fix in a restaurant. I was only tempted to try a morsel off Daddy-o’s groaning German restaurant plate once in my life, and that was when he pointed to a pile of potatoes on his plate that was studded with a hefty helping of bacon. Huh, I thought, looking at the pile. I like potatoes. I like bacon. I love potatoes and bacon when they’re put together. Could it be? I eyed my father warily. 2) Daddy, Mr. Stingypants, was offering to share an item of food off his plate, which he never does. These reasons alone should have tipped me off, but all I could think was, potatobaconpotatobaconbaconpotato and I went in for the kill. Sweet and sour misery. Even bacon couldn’t salvage the nastiness in my mouth. I downed my glass of water with an agitated gasp, praying that it would stay down, lest I have to taste it a second time around. German food, I hate you. But I do love my Daddy-o, and sometimes I like to surprise him. I’m especially liking surprising him in my middle age, because I’ve matured a little and I like monkeying around with recipes and I don’t get to see my parents as often as I’d like, so when I do get to see them, I aim to please. I scoured a bunch of different recipes for German potato salad and ended up with a bastardized combination of them all, because I couldn’t find one that seemed quite right. Some seemed too sweet (1/3 cup of sugar?! In potato salad? Gaaa.) Some seemed too bland. Some were swimming in bacon fat, and I’d like to live another year. Some included things like pickles that would send my husband running for the hills. 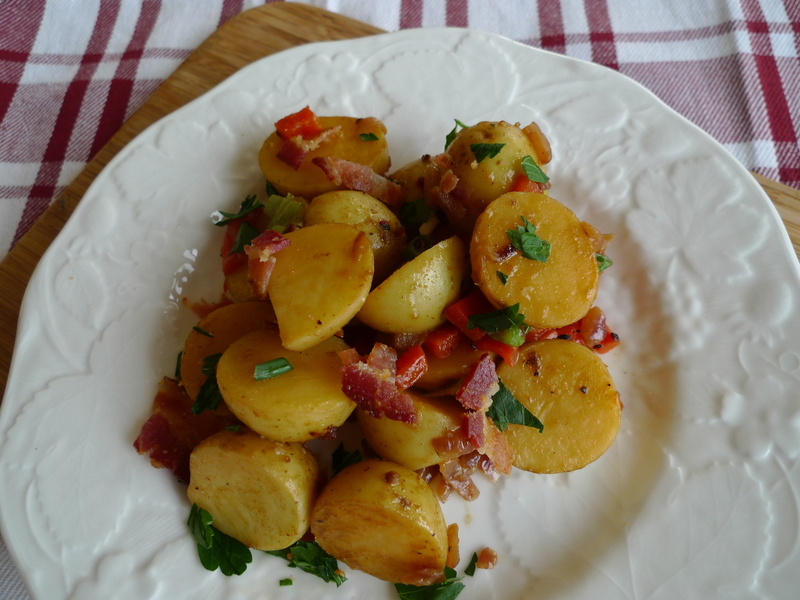 In the end, I settled for a version that had a nice balance of bacon to potato, was more tangy than anything–very little sugar involved, had some freshness from herbs and just enough punch from Dijon mustard to keep things interesting but not tip off my husband that, “Yo! Mustard is involved, here!” I also liked the addition of roasted red bell pepper, something that I stole from Sunny Anderson’s recipe for German potato salad. If you’re not going heavy on the bacon, the roasted bell pepper adds that little extra smoky flavor to give the potatoes character. Daddy was downright shocked when I served this, but we were pleased with the results and I happily sent him home with the leftovers. Because German potato salad still isn’t my favorite jam. If I’m going to eat it, though, this is the version I’m making. It’s good served warm or at room temperature, and there’s no mayonnaise action there, so you won’t have to worry about poisoning someone if you bring it to a picnic. I actually prefer this salad at room temperature and think the flavors blend better if you let it sit a bit before you dig in. Turns out, a German girl can change her stripes. Or polka dots. But just a little. Cover potatoes with cold water and bring to a boil. Cook until just tender when pierced with a fork, about 20 minutes. Drain and set aside. Cook bacon in a large skillet until browned. Remove bacon and place on paper towels to drain. Crumble bacon and set aside, leaving the bacon fat in the skillet. Heat the bacon fat again in the skillet until bubbling. Add onion and garlic and saute until tender. Add the chicken stock, vinegar, sugar and Dijon mustard and whisk until well incorporated. Add the potatoes back into the skillet and cook until the liquid is almost completely absorbed and very tender. Season with salt and pepper. Toss the potatoes with the fresh parsley and the roasted red bell pepper. Top with crumbled bacon. 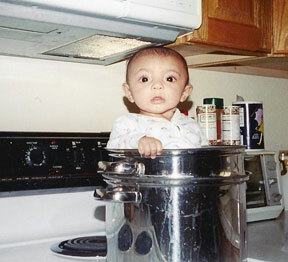 Serve warm or at room temperature. I like to let the potato salad sit about an hour at room temperature to allow the flavors to develop. **The Easter menu this year is geared to please Mama’s tastes, since she had to endure the German potato salad with us already. 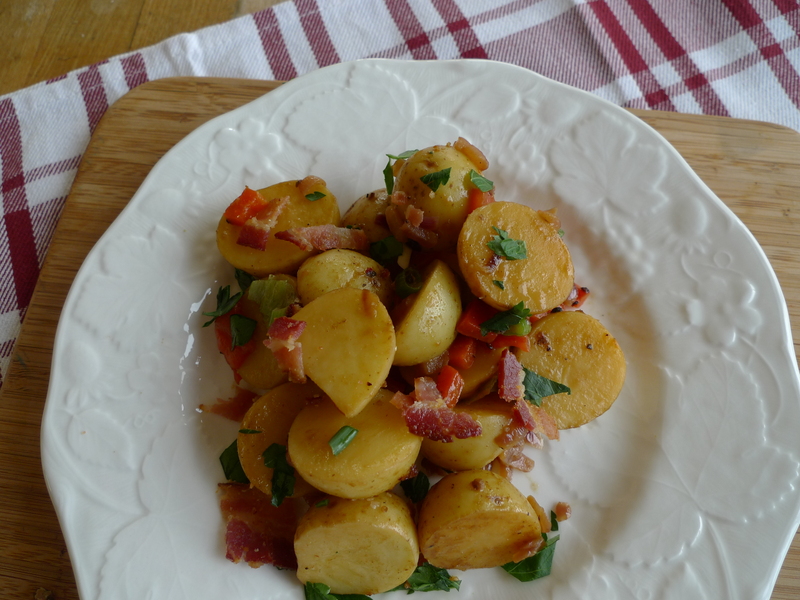 Potatoes and bacon- yeah that is a combination that usually calls out to me. Well, this American born daughter of a Bavarian mutti begs to differ. Sweet and sour potato salad would make my mother come back from her grave. You didn’t find my German potato salad recipe? It’s one of my most popular posts. Yes, there’s bacon. There’s onion. Parsley. Vinegar. Oil. Just enough sugar (a pinch) to offset the tartness (or leave it out). Obviously Sunny hasn’t eat real potato salad, as bell pepper would be blasphemy. But, who am I to judge? At least you tried it. By the way, I don’t eat a LOT of German food, either. I draw the line at head cheese, blood sausage and anything involving entrails. Gimme a schnitzel, homemade spaetzle and red cabbage (and I do love it) and I’m happy. Just don’t pass the sauerkraut. I’ll toss it across the room. That stuff is nasty! As a German who tends towards other cuisines – preferably French – , I can see what you´re talking about. So your take on potato salad is very much up my alley!